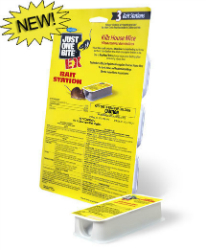 Each disposable bait station is preloaded with a 0.5 oz block of Just One Bite® EX mouse bait. Moisture-resistant mouse bait contains bromethalin. Due to Stop Feed Action, rodents cease feeding after consuming a toxic dose. Effective against anti-coagulant resistant house mice. Each blister pack contains 3 bait stations.